Mining Operations at Mount Mica & Orchard Pit Mines, Oxford County, Maine. With the discovery of the giant red tipped tourmaline, now dubbed Mt. Fuji, it's red tip reminding us of Fuji's snowy peak, we hoped we would find more tourmalines similar to the water colors in Hamlin's book , The History of Mount Mica. Polychrome tourmaline is indeed an interesting mineral as the colors it displays and their combinations seem almost endless. It is a pity though, at Mount Mica at least, the color zoned crystals whose multi-colors are anything more than more than veneers, and whose size exceeds a match stick, tend to be badly broken. It is sad to open a pocket only to find a collection of colored shards still laid out in the form of the original crystal but looking like some fossilized dinosaur flattened into only two dimensions. Hope, however, springs eternal. Towards the middle of November I had to abandon the quest in order to attend to some European and Middle Eastern business.The trip kept me away from the mine until mid-December. 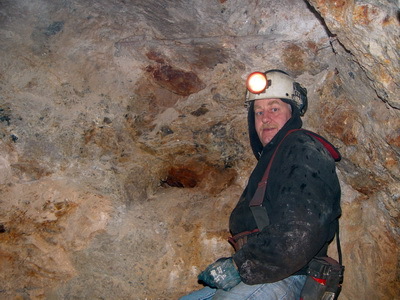 Mike O’Neil, a mineral enthusiast from Bangor and developing miner, had worked with us for a brief period prior to my departure. My hope was that he and Richard could maintain a level of activity in my absence. My hope was soon dashed as the effort lasted for about a week before Richard suddenly called a halt to our mining season…. without consultation (HR : note to file). All of the equipment was hastily put away and the mine shut down and left to the ravages of winter's ice. Fortunately this non-consultative action was not to persist after my return for the subsequent 4 weeks of mining would be some of our most productive. 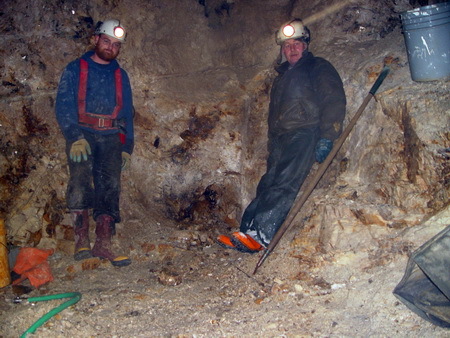 Before the abrupt cessation , Mike and Richard had worked both the down dip of our advance and an area up dip. Though the down dip side showed some enrichment in lithium minerals (see New Lithia Zone at the right), our room and pillar approach dictated that they stay right there. In fact, there was precious little wall between this area we were working and the adjacent gallery (Merrill Room ). No matter ,as ahead (west) and to the right (up dip-north) there was an abundance of blocky feldspar above the garnet line that showed promise. This area was to be the focus of our late December and January work. In fact, just before the hiatus by fiat, Richard and Mike had drilled into a small pocket that spilled water. (In the picture below, Mike ,on he left, and Richard frame their pocket). Heretofore, running water had been a reliable harbinger of more space. In this area most of parts of the face oozed water. We had an indication from tape and compass work that we were approaching the eastern water filled pit. There was however a considerable uncertainty as to our exact position relative to the outside. Trickling was not a surprise and may have been an anti-diluvium warning sign. In any event, running water, regardless of source, needs a conduit. We hoped the plumbing system consisted mainly of pockets. The last thing that Richard and Mike attempted before shutdown was to start a new advance using a new drill pattern for the burn we had devised. In this new pattern we would drill (2) fewer holes and load (3) less there by reducing the powder factor. This experimental pattern required (13) 10 foot holes with (4) of these holes reamed to 2.5 inches. Each of the holes to be loaded was to be equidistant from a reamed hole…. about 5-6” inches. Complete success would produced a hole roughly 24 inches square by 10’ deep. This would form the burn or 'stovepipe 'of our new advance. Unfortunately the pattern was drilled 3x the planned spacing. The results were not good… actually quite terrible. The drill pattern was still in the wall not the least bit disturbed by the detonation of a king’s ransom worth of explosives. Nothing much ‘pulled’ at all. With experimentation the results are not always as hoped. Once back in operation after the unscheduled hiatus, a couple of helper holes and another tranch of explosives, the burn was completed. We plnned to retry this new pattern later. Right after the holidays, we resumed driving our advance in the up dip direction. We drilled a series of holes all along the western face of the advance. We planned to shoot these holes with great care as we were confident there were pockets behind this face. 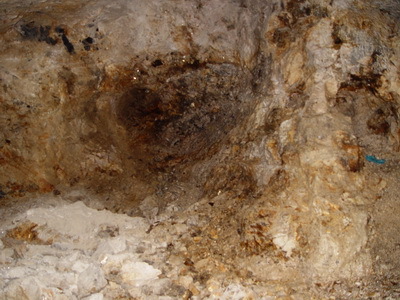 Both the way the pegmatite drilled (soft) and the blockiness of the feldspar were positive indications. 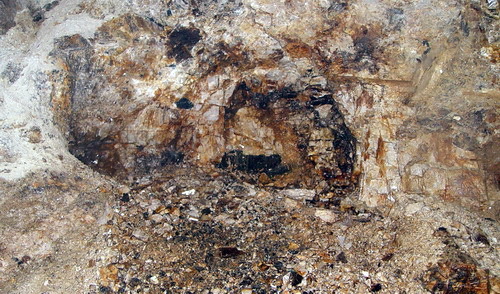 In the image below the blockiness of the feldspar is easily visible just above the floor. In the image our latest advance is visible to the left. A series of 12 newly drilled holes can be seen in the face to left of Richard. Richard is looking into the pocket that he and Mile found in December. Our approach in shooting these holes was to work a single row at a time. The pattern had been drilled in a 3 tall by 4 wide grid. The plan was to load and shoot (2) holes at a time. 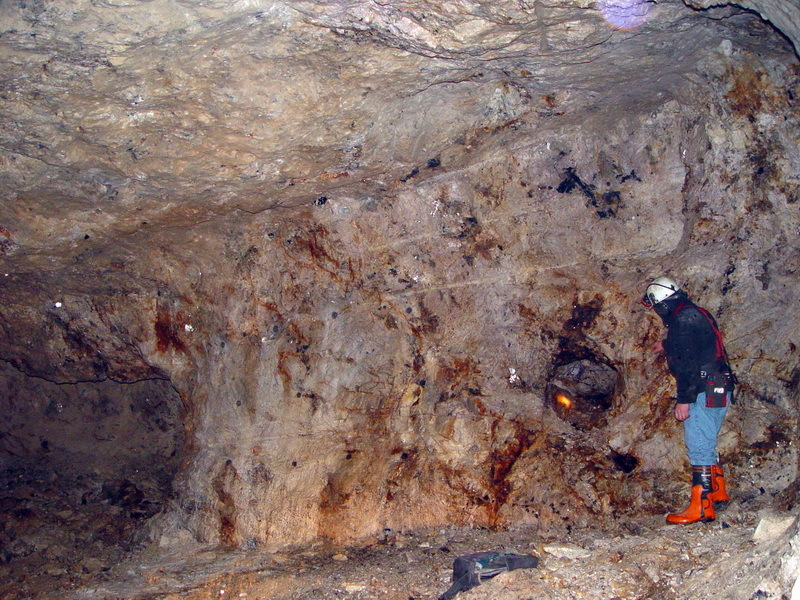 Either the middle and upper hole or the middle and lower hole based on the mineralization. .We'd leave the hole we thought to be in the pocket zone for last. In this way we hoped the blast from the first (2) holes might peel the rock in such a way as to expose a pocket in the remaining rock. The trick is to avoid casting the pocket into the muck pile. We were very lucky with our first shot as shooting the upper and middle holes revealed a 'peep hole' into a pocket. This pocket was not a total surprise. 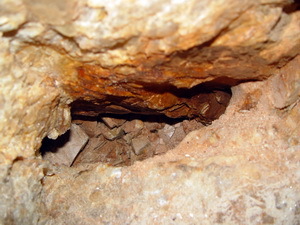 In the image above the lower left most hole has stained the face with rusty water. The percentages were decidedly in our favor. Once we had hand chiseled the opening a little wider , we could see a pile of jumbled feldspar crystals. More chiseling by hand and with our pneumatic chipping hammer opened the pocket, MMP1-08, still further. 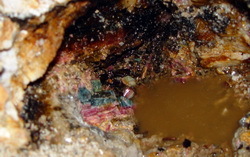 Using a garden hose fueled with near freezing water to wash away pocket 'mud', a fossilized tourmaline began to emerge. Fortunately for the income side of the Coromoto Minerals accounts ledger this one was gemmy and blue i.e. 'revenue rock'. 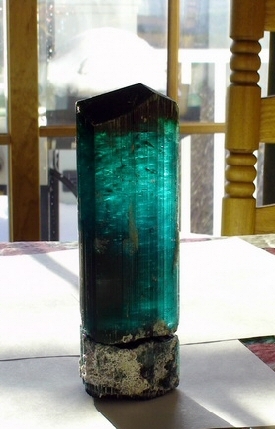 Blue, especially aqua blue, is one of the most desirable colors for tourmaline. The pocket contained a few smaller pieces but these were by far the best. Here Richard stands in front of pocket 1-09 just after the blast. The back of the upper drilled hole is just above his head. The middle hole crosses just at his eye level. In this case, the 'peel' operation worked as intended. Pocket 1 was found on January 8th. On the 11th, upon shooting (2) more holes in the next row and the remaining hole in the first row, exposed a pocket in the back wall. This pocket was perhaps an extension of pocket 1. Again, using the garden hose, we teased a large crystals, broken into many pieces, from the pocket debris. 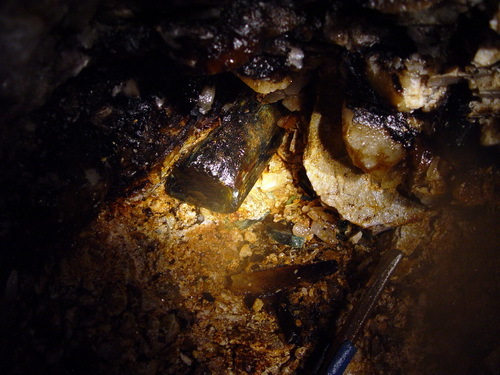 Frequently the cause for these fractured crystals are laid at the feet of the blasters. Though on occasion, and those are quite rare, blasting may damage a crystal, the blasters ,with justification, can plead innocence. Further, I don't believe the phenomenon referred to as 'pocket rupture' is the motive force in this destruction. 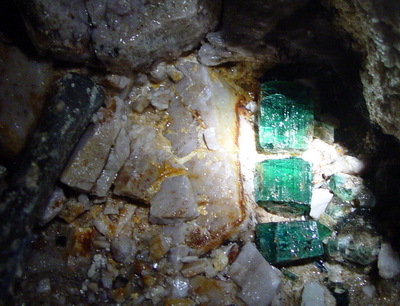 Frequently a badly fractured tourmaline will be lying adjacent to a large and pristine quartz crystal. Quartz is notoriously easy to 'ding'. The cause(s) is, in my opinion, to found within the crystal itself. Most of these breaks lie on color boundaries. Perhaps differential growth rates or differing coefficients of expansion may be the cause. Pocket 2 of 2009 just after it was chiseled open. Note the blocky feldspar along the pocket margin. 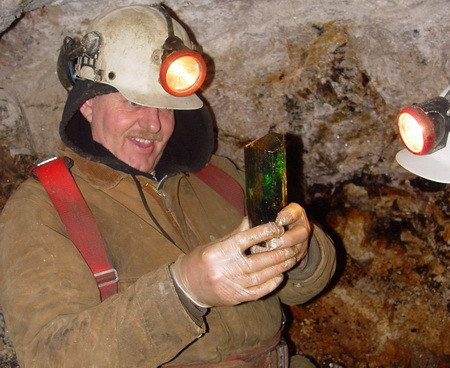 A large green but fractured tourmaline in the pocket. So far each of these pockets seemed to house just one large crystal. This is in contrast to many other tourmaline pockets at Mount Mica. Generally there is an abundance of small crystals as well. Pocket (3), the next one we opened, was to be the exception. It was completely barren. By this point we had worked 3 of the 4 rows that we had drilled along this latest advance. It was now mid January and winter was making its presence felt. Cold weather adds an extra dimension to the continuing parade of problems that mining presents. Broken air lines, leaky water hoses electrical issues and so on are typical under any conditions. With cold weather add in frozen pumps ,compressors that wont start ,slippery surfaces, frozen locks and painful body parts. The list seems endless. My estimation is that if June can be defined as 100% efficient, January scores only 65%. With this drop in efficiency so does 'tonnage'. The pace of discovery is directly proportional to tonnage. We still had one row of holes left and the lowest hole from row 3. When these were done so would our mining season. I just couldn't coax Richard to endure the cold weather much longer. This row was just to the left of the pocket found in December so we were hopeful. We loaded and shot the remaining hole of row 3 and the (2) upper holes of row 4. After the dust and fumes has cleared we returned to see what the Rock Gods may have granted us...or not. It was immediately clear that the pocket from December did indeed extend back into the face. (The December pocket is visible to the right in the image above and barren pocket MMP3-08 is near the center of the image.) First we tried to hand chisel and then switched our pneumatic chisel an effort gain access to what we hoped was a space. After a couple of hours of effort it was evident we would need the assistance of chemical energy. With some trepidation we loaded the remaining hole in row 4. We were gambling the hole was sufficiently to the left of any space that the mini blast we planned with just kick out some of the bottom. The results were pretty much as we had hoped. 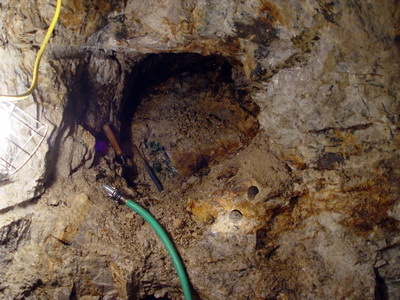 The blast broke the lower part of face and sheared some of the hard feldspar from the side of the now confirmed pocket. Only it's contents was the issue. Simply touching the feldspar caused it to crumble. This time we had done a good job on the approach. Though it was late in the afternoon we decided to pause so that Mary could suit up and join us in the actual opening of the space. We had no clue as to what we would find. Once Mary arrived only a few probes at the crumbly feldspar followed by a couple of squirts from the garden hose made clear this space had something. We could soon see what appeared to be a large tourmaline resting in the soft cookeite sand of the pocket and covered by collapsed pieces from the pocket roof. We dared not hope that this crystal would be intact. We fully expected that the concealed part would be scores of broken pieces. Carefully, piece by piece, we removed the debris from around this rusty black tourmaline. As we did so, the sides continued to lengthen. Finally we could stand the suspense no longer. I grabbed the protruding end and extracted the tourmaline from where it had laid quietly for the last 300 million years. Upon seeing the crystal , pocket rapture took hold as we stared in amazement at the crystal. The 'black' tourmaline was in fact an complete elbaite crystal with a perfectly formed termination. Though we had found small crystals this well formed, nothing we had heretofore found approached the proportions of this one. Estimates of its value spiraled uncontrolled. We each took turns holding the piece and examining it from all angles with the light from our cap lamps. We still could not believe the prism was intact. Under the yellow incandescence of our cap lamps and the crystal's light coating of rust, it appeared to be green. Later under daylight illumination and with the rust removed , the crystal was decidedly not green. Why did this crystal escape the destruction that was the lot of almost every other tourmaline we had found so far? My best guess is the near monochromatic makeup was the reason. In fact the crystal was found in two parts. The upper blue part had parted from the lower deep blue-black section right at the color change boundary. This crystal seems to have been a schorl that had grown into the pocket but had not undergone the multitude of color transitions of other tourmalines. 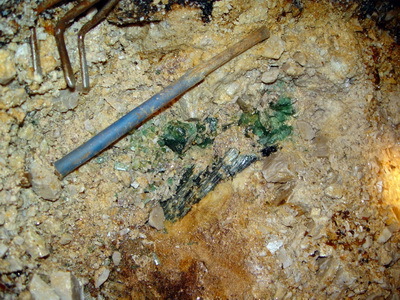 In the pocket wall image above the root of this crystal can be seen as crumbly black schorl near the center of the image.